Photographing a wedding and the bridal party, bride and groom, can be interesting, fun and you never know how it will all play out but you always has a wedding photographer want to create amazing images that tell the story from that day. 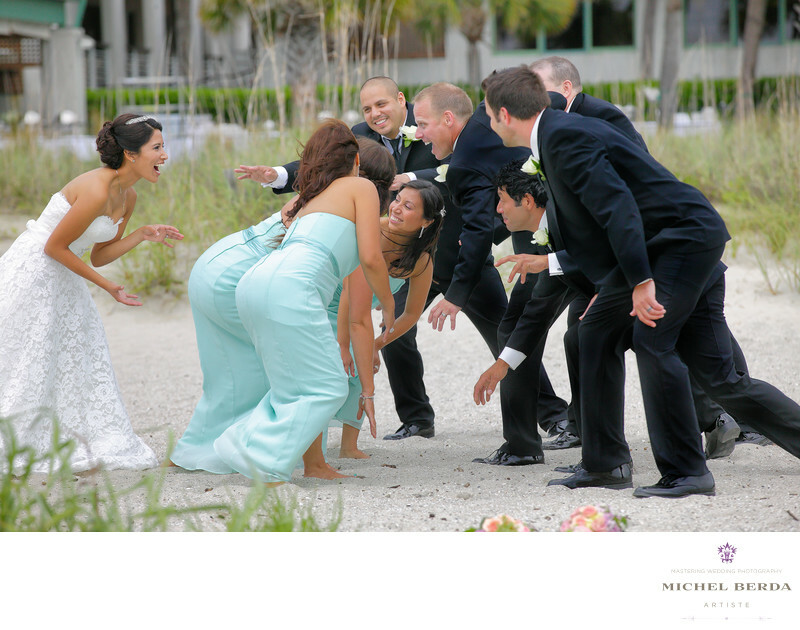 On this wedding day, after the ceremony at The Westin Resort & Spa In Hilton Head South Carolina, when it came time to capturing the couple and bridal party there is nothing better then when you have everyone enjoy themselves and want to create a different images, in this particular situation that I love, we came up with a football theme, the groom and his groomsmen decided to be the defense while the bride was in the offense by being the quarterback, the bridesmaid protected her, what an emotional capture on hut, I created for these fantastic clients and bridal party. It truly has a great feel to it, and being on the beach in the sand at The Westin Resort & Spa, in Hilton Head made this image just that much more real. Keywords: Destination Wedding Photographer (117), Hilton Head (75), sc (309), south carolina (24), The Westin Resort & Spa HHI (27), The Westin Resort & Spa in HHI Weddings (27), Wedding photographer In Hilton Head (66), Wedding Photographers (198), Weddings (168).